Private labeling what is the advantage to your company? AMSA, Inc.BlogIs there an advantage to Private Labeling? Private labeling is one way to stay ahead of the competition. As the chemical manufacturer of BCP™ 1015 (DTEA II™), AMSA, Inc. has spent considerable time, effort, and money creating a brand awareness to our chemistry. We are proud to have established such a strong, positive image as a manufacturer of this very powerful chemistry. BCP™ 1015 (DTEA II™) is held in high regard as an organic deposit penetrant, dispersant, and cleaner throughout the industrial cooling water community. This is a reputation we have worked hard to achieve and will work hard to protect. Over the years we have received feedback from customers requesting to private label the chemistry with their own name and logo. While we understand our brand identity linked our product to us as the manufacturer, we also understood the need for water treatment companies to link their products and services to their companies. Water treatment companies have spent considerable time, effort, and money branding themselves as the “go to” company for water treatment in their city, region, and territory. It only made sense to have a private labeling program so that these customers could retain their customers and also stand out from their competition. 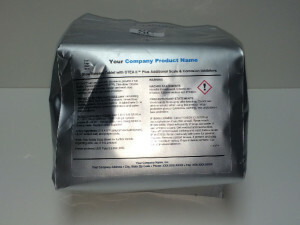 Private labeling allows our customers to brand the chemistry to their company. This gives them an advantage by keeping their company top of mind with the building managers, operators, and end users they service. It also helps them to stand out from their competition, because chances are the only way the competition could get their hands on their chemistry would be to buy it directly from them. If you are interested in private labeling your BCP™ 1015 (DTEA II™) you can contact us directly by emailing us at sales@amsainc.com. One of our customer service representatives will be glad to help create a private label for you. If you are a tablet customer, click here to request a quote to private label your tablets. By private labeling your product you can build a marketing program around the product, and with a little hard work you will create a brand awareness that is linked to you as the water treatment professional. Once the word gets out regarding how well your treatment programs are performing, more and more people will contact you for your services!